This morning on CBC Radio 1’s Metro Morning, the question of what each party will do about transit was asked of Transportation Minister Kathleen Wynne, the NDP urban transportation critic Cheri DiNovo, and the Conservatives’ transportation critic Frank Klees. Wynne highlighted the 8 billion committed to the Eglinton Scarborough Crosstown line that Ford wants entirely underground. 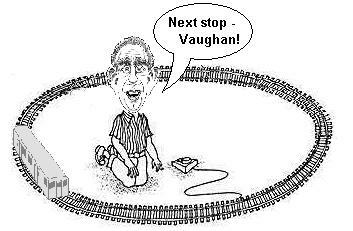 DiNovo was pushing the idea that Transit City was fatally wounded by McGuinty cutting funding well before Ford arrived and dealt the final wound, which Wynne argued did not involve any cut, just a cash flow delay. Never mind that Ford’s platform was only to cut gravy. His transit plan was conceived and presented in an amatuer YouTube video released late at night, while every single appearance and interview he did always had him direct the discussion to the “Gravy Train”. Sure, there were plenty of voters along Sheppard Avenue East who picked up on his plan to extend the Sheppard subway and said, “Yea, I want that for sure!” Trouble is, only a small number of them live west of Kennedy Road which is where the subway’s alignment would depart from Sheppard. Everyone east of Kennedy bought into a Sheppard subway just like one woman who was interviewed during the election who looked forward to not having to wait for a bus at McCowan and Sheppard. She’ll have a better chance catching a flying pig. On a related note (Ford’s fixation on the Sheppard subway), Chris Selly has a good article in Posted Toronto. An Investment in Public Transit? The guarantee will be that GO train riders will get a refund if their train is more than 15 minutes late, down from the previously announced 20 minutes. The exceptions to this will be delays caused by extreme weather, police investigations, accidents and medical emergencies. So what makes this an Investment in Public Transit? That’s right, McGuinty will use your tax dollars to pay out these refunds when they occur. Some investment! Operation of GO Trains is contracted out to Bombardier Transportation (with the exception of the Milton service, which is operated by CP Rail). Since the exceptions, quite fairly, involve situations that are beyond the control of the operator, why isn’t the cost of the refund being borne by Bombardier when their contract is renewed? Bombardier has a five year contract to operate the trains that started in June 2008, so there is still two years before another contract would be in effect. The current contract with Bombardier has penalties, but only when a train does not run due to crew shortages. It may be understandable that the province might foot the bill for a service guarantee in order to have it in place sooner than the contract renewal, but there is no word of transferring this cost to the operator with the next contract. In Melbourne, the operation of trams (Yarra Trams) and trains (Metro Trains) are contracted out and the contracts require a performance target for punctuality and reliability to be maintained. Instead of refunds for passengers of a specific train, the performance is measured monthly and if the standard is not reached, the operator must pay compensation to all eligible passengers. To be eligible, a customer must use a monthly, six-monthly, or yearly Metcard, or use the myki card (their version of Presto) that was valid for at least 28 days and was used on at least 10 days in the compensation month. Compensation is in one-day fare units. Metcard users receive a day pass for their same zone for each unit and myki users receive an uploaded credit for the value of a day pass for their same zone for each unit. For instance, Metro Trains is required to run 98% of their trains and maintain 88% on time. If either of these are not met, eligible passengers will receive a one-day fare unit. If the delivery is less than 95%, two units must be provided for compensation and the same goes if the punctuality is below 84%. If service is bad enough, each eligible passenger would receive 4 one-day fare units! In May 2011, their delivery was 98.8%, but punctuality was only 82.2%. I should add that a train is considered on time if it arrives at its destination between 59 seconds earlier than and four minutes and 59 seconds later than its scheduled time. Given that GO Transit claims 95% of their trains are on time, and I assume that is the percentages of actual trains that run, they already exceed the standard set in Melbourne. Simply put: let’s put in a subway because it is a really neat thing to have and it would be fun! Who would say no to rapid transit?!? Other considerations? We want the shiny train, because nothing we have seen, tried, or heard of someone who has tried, goes as fast! Nice present for Sorbara’s constituents - that is, until it opens in seven or so years and only every second or third train goes that far north. There is another version that addresses the Yonge Street extension here. The Thornhill race was won by PC candidate Peter Shurman and the Richmond Hill race was won by Liberal candidate Reza Moridi. In the outlines of the candidates prior to the election, I only provided a summary of where they stood on rapid transit options without any of my own opinions. Now that the election is over, I will provide my opinions on the winners.